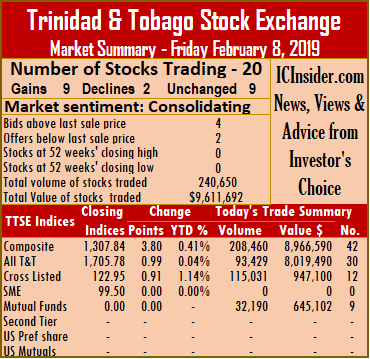 Market activity on the Trinidad & Tobago Stock Exchange ended on Friday with trading in 20 securities against 18 on Thursday, with 9 advancing, 2 declining and 9 remaining unchanged. At close of the market, the Composite Index rose 3.80 points to 1,307.84. The All T&T Index rose 0.99 points to 1,705.78, while the Cross Listed Index gained 0.91 points to close at 122.95. Trading ended with 240,650 shares at a value of $9,611,692, compared to 409,577 shares on Thursday valued at $4,344,587. IC bid-offer Indicator| The Investor’s Choice bid-offer ended at 4 stocks with bids than their last selling prices and 3 with lower offers. Stocks closing with gains| Agostini’s closed with an increase of 5 cents to $23.20, after exchanging 115 shares, Calypso Macro Index Fund gained 49 cents trading 555 shares to close at $14, Clico Investments ended trading with a rise of 2 cents and ended at $20.12, with 31,635 stock units changing hands. First Citizens closed 5 cents higher at $34.05, after exchanging 700 shares, Grace Kennedy concluded trading of 4,800 stock units and rose 4 cents to end at $3.10, JMMB Group added 1 cent and concluded trading of 15,208 shares at $1.76. NCB Financial Group gained 5 cents to settle at $8.45, after exchanging 3,000 shares. Republic Financial Holdings rose 11 cents and settled at $107.66, after exchanging 235 shares and Unilever Caribbean closed with a gain of 6 cents at $25.06, after exchanging 1,205 shares. Stocks closing with losses| Angostura Holdings lost 1 cent and ended at $16.03, with 112 stock units changing hands and Trinidad & Tobago NGL closed with a loss of 20 cents and completed trading of just 25 units at $29.30. Stocks closing firm | Guardian Holdings completed trading of 600 units at $18, Massy Holdings closed at $47.66, after exchanging 982 shares, National Enterprises ended at $8, with 4,122 stock units changing hands, One Caribbean Media concluded trading at $10.35, after exchanging 100 shares, Prestige Holdings completed trading with 1,000 units, at $7.40. Sagicor Financial ended at $9.11, after exchanging 92,023 shares, Scotiabank ended at $63.65, with 4,910 stock units changing hands, Trinidad Cement settled at $2.50, after exchanging 562 shares and West Indian Tobacco ended at $95.50, with 78,761 stock units changing hands.